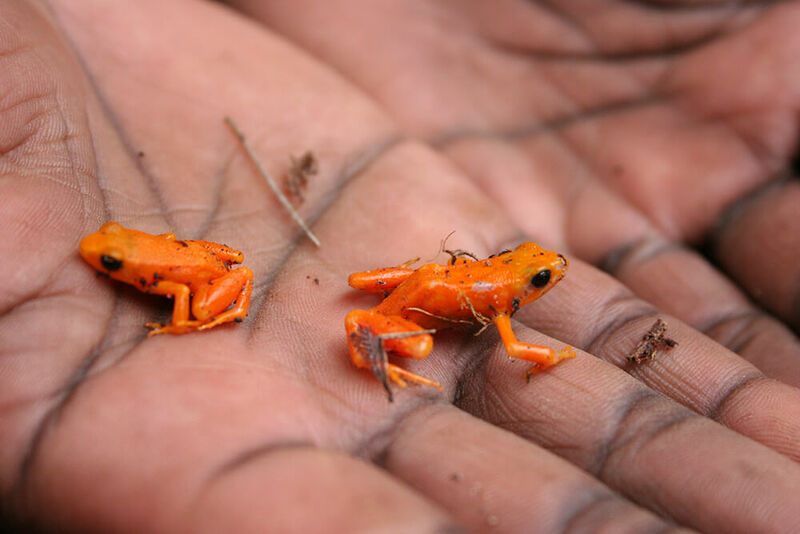 Poisonous jewels of Madagascar: Tiny mantella frogs are among the most brightly colored and spectacular of all frogs. Most can be found in a variety of color combinations—inky black with brilliant splotches of orange, bronze, yellow, blue, or emerald green. These bright, eye-catching colors serve as a warning to predators that the little frogs are poisonous. All mantellas have toxic skin secretions, some more so than others, but they all have the bold, beautiful colors that seem to shout, “I’m toxic!” This is known as protective mimicry or aposematism, a very clever adaptation. By having the bright colors of the more toxic species, the frogs are avoided by predators. But the most glorious coloring in the world won’t protect a mantella if it can’t be seen, and that is why all mantellas and poison frogs are diurnal, while most other frog species are nocturnal. Mantellas are found only on Madagascar, an island nation off the eastern coast of Africa. Many mantella species secrete toxins like those found in South America's poison frogs. They get alkaloid toxins from the prey that they eat: primarily ants, termites, and fruit flies. They then use these toxins for their own chemical defense. While not deadly like the golden poison frogs, mantellas secrete enough toxins to make a predator sick or, at the very least, the little frogs can make themselves taste quite nasty! Interestingly, human actions can affect how toxic mantellas might be. For example, mantellas living in areas untouched by human activity have more alkaloid toxins in their bodies than those living in areas that have been polluted. Why? As humans move into mantella habitat or pollute it with contaminants, many of the frogs' prey items are killed off, and there is less variety for the mantellas to eat. Fewer food choices mean fewer alkaloids to be absorbed which leads, eventually, to less toxic frogs. Besides their bright colors, toxicity, and diurnal natures, mantellas also share some other remarkable similarities with their distant poison frog cousins. Both live almost entirely on land, although two mantella species spend a lot of time in trees. And, like poison frogs, mantellas are quite small, reaching no more than 2 inches (5 centimeters) in length. How can two animals that are not closely related end up being so similar? Both frog families evolved to fill similar niches, so they developed similar adaptations. This is known as convergent evolution. Most frogs have webbed toes to help them swim, but not mantellas! They spend their lives crawling around on the jungle floor among leaves, under decaying trees, or occasionally on branches close to the ground, so there is no need for webbed toes. They also have short legs designed more for climbing than for long hops. Arboreal mantellas have swollen, sticky fingertips that help them hang on while moving around aboveground. Adult mantellas live in small colonies with an average of two males for every one female. During the spring breeding season, males claim and protect territories, calling out to the females with a series of short, very rapid clicks. If another male mantella wanders into guarded territory, the owner wrestles with him and pushes him back out. A female mantella waits until the first big rainstorm of the season and then deposits her eggs in damp leaf litter or in a short tunnel she has dug; the climbing mantella female climbs in trees and deposits her eggs in tree holes. Male mantellas then tend to the eggs until hatching. The eggs hatch into tiny tadpoles a few days later. The little ones are washed by rainfall into small pools nearby, where they eat algae and grow. About 6 to 8 weeks later, the tadpoles have become wee froglets that measure about 0.4 inches (11 millimeters) in length, or about the size of a dime. The young frogs are a dull brown that keeps them well camouflaged in the leaf litter. During the next several months, they gradually change into the colors of the adults. They reach sexual maturity after a year. The San Diego Zoo began exhibiting mantellas in the late 1980s and has successfully bred and maintained the critically endangered golden mantellas and bronze-backed mantellas. Our Reptile Walk features reptile, amphibian, and California native species exhibits. It is located in the Discovery Zone, just across from our Galápagos tortoise exhibit, and includes golden mantellas and bronze-backed mantellas as well as poison frogs, newts, and other fascinating amphibians. Like all amphibians, mantellas have skin that soaks up water. If something happens to change the water, amphibians are one of the first species to feel it. Much like frog species from all over the world, the health of mantellas can help scientists determine the health of Madagascar’s rain forests, air, and waterways. Because mantella populations are small, the slightest problem or mildest pollutant could be enough to completely wipe out a species. Eleven mantella species are either at critical risk, endangered, or vulnerable. Threats to these delicate frogs include habitat loss, contaminants, introduced species, global climate change, and collection for the pet trade. Some species, like the golden mantella, live only in tiny, limited areas, making them sensitive to over collection by people wanting to have the colorful frogs as pets. The San Diego Zoo is involved in breeding two mantella species to learn more about them and to help preserve these jewels of the rain forest for future generations. The golden mantella is the most well known of the species. Individuals can be yellow, bright orange, or orange-red in color. The variegated mantella lives in the high grasslands of Central Madagascar. It burrows during the dry season to keep from drying out. A group of mantellas is called an army. Scientists once believed that Madagascar’s mantellas and South America's poison frogs were closely related. But DNA studies have shown that they are only distant relatives with similar bright, warning colors.